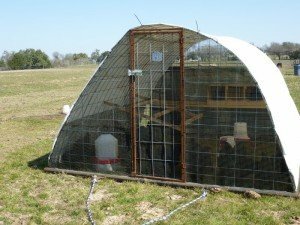 Matthew, who raises Black Australorp breeders and supplies us with hatching eggs, uses several 10 foot x 10 foot or 10 foot x 12 foot metal frame hoop coops to house his flocks. Each coop contains roosts, nest boxes, hanging feeders and has room to place water founts. 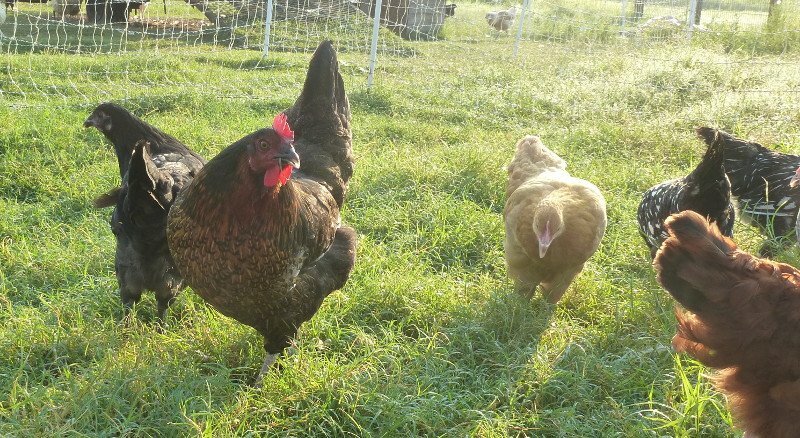 He generally keeps about 10-14 birds in each coop and moves them about on pasture, moving them onto fresh grass every two days (weather- and time-permitting). 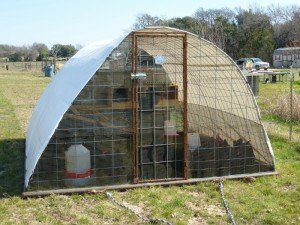 His coops are welded together, with pipe for a base and cattle panel to form the hoop structure. He generally uses a 12-volt winch to move them. Everything except the fount waterers is attached to the coop, so he has only to move those out of the way before moving the coop. The welded metal frame seems to be very durable. The hoop structure is covered with white, fiber-reinforced sign vinyl or billboard vinyl. The fronts and backs are covered with vinyl coated 1/2″ mesh hardware cloth, as is the lower portion of the sides (beneath the tarp). During winter, he attaches sheet metal to the north-facing back wall of the coop to make it less drafty, then he removes the panel for better ventilation in the summer.